Take a minute right now, this very moment, and jot down everything you would like to accomplish by the end of the day. 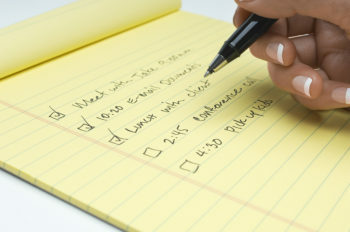 Use paper and pen, your phone, or any other technique you use to keep track of your lists. Don’t read any further in this blog until you’ve completed this. As I review my list, I notice that there’s nothing really earth shattering on it. Nothing that’s going to make a real difference in anyone’s life. It’s all about things! These aren’t things I HAVE to do, just some ideas to bring more joy into the world. What about you? Do you have any other ideas for a “hope for” list? « Where is Your Safe Place?